These are 6 projects were made as a plasure project in 2011, cuz I love Disney a lot. This is awesome! 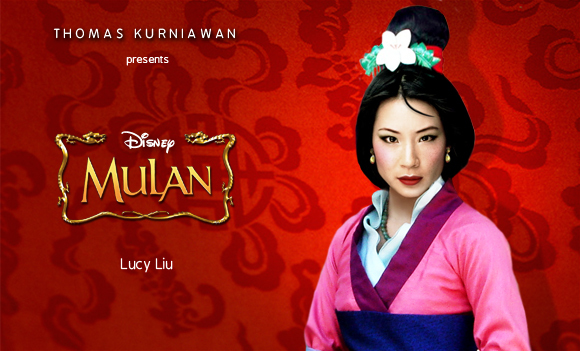 Except Lucy Liu looks too old for Mulan. Jolie is an exception though, she is perfect. Great work! why not emily browning as snow white? she'd be a good fit. she has that young innocent look, and very exquisite(?) as in she's not your typical beauty. Zhang Ziyi would be a better Mulan, me thinks. And since we want young innocent girls as Snow White, why not Justin Bieber? Aishwarya Rai looks a bit too old/mature. But I think Lucy Hale would make a perfect Snow White. I disagree about Jolie. I don't think she fits. Aren't there any actual native american female celebrities?? I really like snow white - it's pretty perfect I think. Her story is innately dark anyway! so sorry... I hope Walt disney see it and make it real too..
You do know he's dead, right? hey.. asa akira is pornstar.. hahah.. you didn't know that ??? Loved it..had a bit of a dislike with the pocahontas version..the head looks too bfor the bodie. These are really good! Amazing! OMG!!! How can I forgot her!!! yeaaahhh Tang Wei is a good Idea!! make more please, they're awesome!!! yes, make more, and zooey deschanel would be good for snow white. oohh.. is she? I just dont know about it... so can u suggest who can be pocahontas better? OMG! I'm trying to think of her name... the actress that played Jackie in that 70's show... but she has done some awesome roles since...ie "Friends with Benefits, Forgetting Sarah Marshall, Black Swan" If you dont agree with her for Pocahontas, definitely she could be Jasmine. Lucy is timeless, so perfect for Mulan in my opinion but if you really want a younger beauty, Brenda Song would be a nice fit. ....Brain freeze over..earlier comment was referring to Mila Kunis for pocahontas (or Jasmine) no matter what... This work is amazing you even manage to bring out a softer kinder side of Angelina "FOLIE"
I have a plan for rapunzel one... with diana agron for the role... what do you think? no,,,,dont use diana agron. use amanda sayfried, she is awesome. actually its not my post... cuz i dont have any account in 9gag... Natalie who post it..
great arts; who's going to be for cinderella? hey... can I ask a favor? please? Cool idea! I love Disney princesses :) My dream job would be playing Belle at Walt Disney World lol! Reading the comments... maybe Ziyi Zhang for Mulan? Q'orianka Kilcher for Pochahontas? Mandy Moore for Rapunzel since she was the voice? hehehe! This is greattt!! Snow whites a lil bit off though. But great work anyway!! Waahhhh.. gambarnya masuk Hot page 9gag.com. This is really good work. I'm cheering for you. Hope there are more. 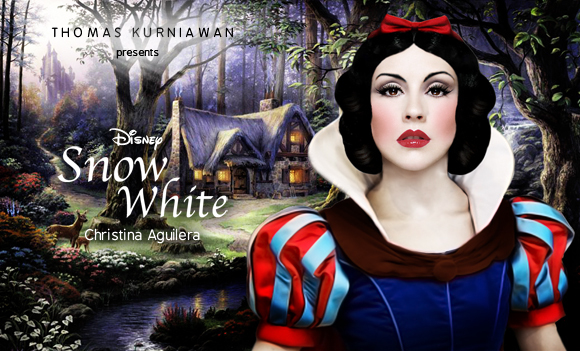 I just think that Christina Aguilera isn't good for snow white. Snow white is pure, angelic, kind, shy and Christina is more of the evil queen. Congratulations, this is amazing! I really enjoyed this. The little mermaid Y U NO REAL MOVIE? Wow! Amazing! 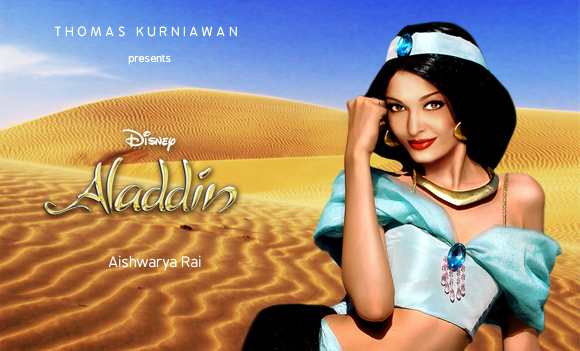 Especially Aishwarya Rai Bachchan as Jasmine "Aladin", great idea! Where is Aurora from Sleeping Beauty? Um, I would say getting an actual Native American actress to play Pocahontas (as opposed to a white lady) should be ideal. I really love them all (especially Angelina Jolie as Pocahontas! Shay Mitchell for Pocahontas would be look good !! I'd suggest Anne Hathaway for Snow White, Natalie Portman for Belle and Kaya Scodelario for Ariel. Your work is very good. Your imagination is commendable and it's obvious that your are very talented. But, i did not necessarily agree with the choices of actress. Maybe we have different tastes. I thought Frieda Pinto would make a better Jasmine than Aishwarya Rai. 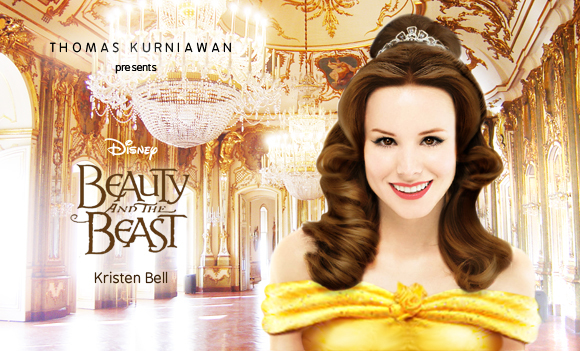 Natalie Portman would be a lovely choice for Belle. As for Pocahontos, Zoe Saldana from Avatar came to my mind first. I'm in love with the little mermaid! Send them to Disney and see what they think!!!! Anika Noni Rose / Yaya Dacosta: Tiana. Karen Gillan might work fore Merida, if you wanted! 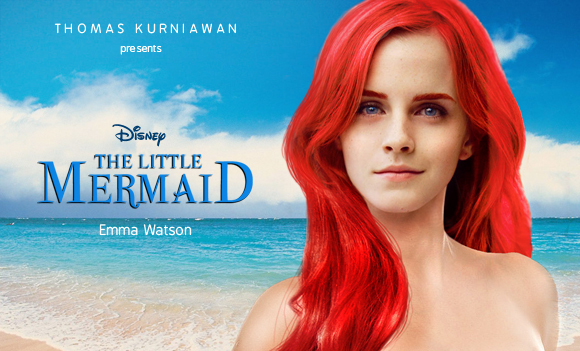 emma watson as Ariel! smoking hot! Love it.. Especially Aishwarya rai as Jasmine.. Beauty. I'd say Selena Gomez as snow white!!! wow ..! Emma looks amazing! !..she's my favorite... she looks so much like the real mermaid! good job man!! oh yeah.. i think.. Selena Gomez as snow white!! I think you work is AWESOME !!! but... I think Rosalyn Sanchez would be PERFECT for Pocahontas, Ashley Tisdale for Rapunzel, and Selena Gomez for The Little Mermaid, keep up the good work ! I'd love to see these movies! Jolie is perfect as Pocahontas! I like them all but I think you shoud do this: Put Demi Lovato as Belle, Selena Gomez as Snow White, That would be very good... dont you think?? PLEASE PLEASE PLEASE DO IT!! :) :) :) :) :) Whos agree with me? iNCREDIBLE IDEA!! TaylorSwift as The Little Mermaid!! It seems lotts of people loved this idea: Im agree: Taylor Swift: The Little Mermaid Selena Gomez: Snow White Miley Cyrus: The Sleeping Beauty DEMI LOVATO: BELLE PLEASE PLEASE PLEASE PLEASE PLEASE!! Who else wants this!!!??? Its not lots of people. Its all the same person named Kate. I kind of hate to think of Taylor Swift, Selena Gomez, Miley Cyrus, and Demi Lovato dressed up as Disney princesses. They kind of ruined Disney for me (Well, not Tay Swift) and I don't like the thought of them trying to represent classic Disney as well. But Demi's actually not that bad. I think Naya Rivera would be a better choice for Pocahontas. NOOO Nicole scherzinger is the perfect pocahontas, check it. Angelina Jolie is just ok.
Are they really doing the movies or are they just making the posters? They all look really beautiful but as a big time Walt Disney movie fan I would love to see some moves made out of these! Are they really going to make these into movies? The posters are beautiful and as a big Walt Disney movie fan I would love to see these all become movies! I think Mila Kunis would make a great pocahontas. I'm not a fan of Angelina "FOLIE" even though you are so talented you even manage to make her look softer/kinder. If you don't like Mila for Pocahontas, I think she'd also make an awesome Jasmine??? As for Lucy Liu, I think she's timeless but if you are looking for an alternate, I think Brenda Song is quite cute. Emily Browning would make a fair snow white. Another choice I'd have for Pocahontas would be Jessica Alba ... Fun Stuff!!!! Jasmine and Pocahontas are the best par of Ur work :) great one! Jasmine and Pocahontas are the best part of Ur work! :) awesome..
What about Disneys Brenda Song for Mulan? Taylor Swift as The Little Mermaid and Brenda Song as Mulan! I thought Snow White was Alyssa Milano! Are you going to do Alice in Wonderland? Are you going to do Alice in Wonderland! The Asian actress Ziyi Zhang who played in memoirs of a geaish would be perfect for Mulan! Lucy Hale Snow white! other than that amazing! I love how you create Emma Watson as Ariel, however I'd say Shay Mitchell is a better fit for Pocahontas, no? And please try Lucy Hale as Snow White~ i like selena gomez as snow white too but she's not fair skinned anough. Mulan and Ariel is a really nice pick. Love it! !